Since the terrorist attacks last year there has been a serious evaluation of what leadership means especially its implications during war. Every age thinks that their world and time is somehow unique. Robert Kaplan makes the case in his latest book Warrior Politics that leaders from the past could successfully operate in 2002. Kaplan has made a career out of doom and gloom. His dire warnings in the pages of The Atlantic Monthly such as his groundbreaking 1994 essay "The Coming Anarchy" and his eight previous books on travel, international affairs and the future of the planet have become a major part of international relations thinking. Today he finds himself in demand advising current leaders such as President Bush. Kaplan looks at figures and books from the past that could help to resolve current problems in the world. 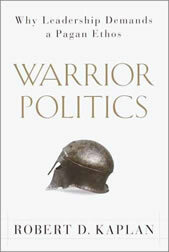 Essentially Warrior Politics is about the shadows of international politics-focusing on war and conflict. This is a realistic acknowledgement that peace is temporary and conflict perpetual. Winston Churchill's The River War, an eerily prescient account of British activity in the Sudan, is one example of Kaplan's assertion: "Our situation is more similar to that of the late Victorians, who had to deal with nasty little wars in anarchic corners of the globe, such as Sudan." The leaders and philosophers that he chooses are from a pagan background. The ideas stretch from antiquity to the modern day-a virtual who's who of warrior thought. From ancient Greece and Thucydides to the Renaissance and Machiavelli into the era of Churchill the book searches for an ideal foreign policy leadership which is ultimately flexible and pragmatic. Many of the authors share a combination of, 'icy, morally detached observation with a moral response." This practical execution of foreign policy is most important to advanced nations. "The more socially and economically advanced the times, the more necessary it is for leaders to maintain a sense of their societies' fallibilities and vulnerability: this is the ultimate defense against catastrophe." A lesson that was sadly overlooked last fall. What Kaplan makes clear is that there may not be good or bad choices in foreign policy, but simply choices. "The more the barons of punditry demand 'morality' in complex situations overseas, where all the options are either bad or involve great risk, the more virtu our leaders may need in order to deceive them." In fact Kaplan seems to be arguing that not only do nations sometimes have to make the best of bad situations but they may have to do things that run counter to some of our more prized values. "The most sincere and heart-breaking truth of the ancients is the vast gulf that separates political-military virtue from individual moral perfection," he writes. "It is such a truth that may help define the twenty-first century, as we are forced to choose in the midst of high-tech war between what is right and what is unfortunately necessary." The reason why, in Kaplan's mind, nations need to think clearly about foreign policy is because the world is much more dangerous than the media lets on. He rightly confirms that globalization and democratization are not the answer to global problems. Noting that we had an expansion of these prior to WWI yet they failed to prevent war. While they do not do anything to hurt global politics, they are hardly a sensible way to run foreign policy. Kaplan does overstate some of the problems he sees in the world. For one he links the poverty of the third world and implies that it is a basis for future terrorism. It is as if morality or common sense is forgotten the moment one is born into poverty. The reality for today is that most terrorists are middle and upper class not lower class. International terrorism has not come from the extremely poor nations. At its core Warrior Politics is about a deep respect for the lessons of the past. What he tries to do is reestablish an appreciation for the ethos and pagan leadership that is often lost today. To counter the post-modern critiques of the present, or the reevaluation of the past based on political correctness, "We need to recover the allure that the classics held for nineteenth-century schoolboys like Churchill, who read them not as critics or fact checkers but for their inspiration." While the book is designed for all people, it has particular meaning for Americans during this war. As the only superpower, America has the most to gain or lose in the international arena. The reason why America in particular and not Canada for instance, is so important is historically based. The US constitution was founded in a pagan ethos based on pessimism. It is a realization that things can always go badly. Working from that perspective and translating it to the international arena one is left to assume the worst internationally, learn from the warrior leaders of the past, and act to persevere. Jackson Murphy is a commentator from Vancouver, Canada. He is a contributor to Enter Stage Right and the editor of "Dispatches" a website that serves up political commentary 24-7.